A quick Google search about Mother’s Day surprised me. I was researching for an article, and Googled, “Why I hate Mother’s Day.” I figured only a few things would appear. Was I ever wrong. As a matter of fact, I was dumbfounded. I feel bittersweetly about Mother’s Day. While they love and respect me for the other 364 days of the year, my husband and daughters make a big deal out of “Mom’s Special Day.” “You are not going to do any cooking or cleaning on Mother’s Day,” my 9-year-old recently declared. “And,” she paused dramatically and looked around the dinner table, “no one is allowed to make Mommy upset all day long.” My kid rocks! This is the sweet part. Bitterness remains in my mouth from being a daughter. I began disliking Mother’s Day from an early age, say around 5 or 6. I could not find my mother in the descriptions that gushed of traditional roles, submissive femininity, and domestic glee. Mothers can be career-minded and strong, I protested. Mothers can mow the yard, fix things, be their own boss, and pack heat. Mothers can love football and John Wayne. Every way I described my mother went against the grain. Eventually I decided that something was wrong with society for assuming that all Moms are alike. I got mad at cultural images of mothers and motherhood. And I blamed Mother’s Day for making the situation worse. Years of Mother’s Days passed. I dreaded every one of them. I wrote theologically about this earlier this week in a blog posted on The Christian Century. Click here to read my article. You’ll notice that I refer to myself as a “recovering undermothered adult.” More to come in future posts about what this means. Up next week: the Mama Taboo. Why we don’t talk bad about Mama. Period. And why we must bust this taboo. 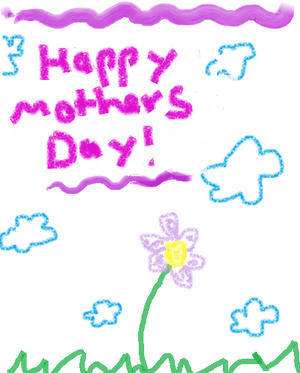 For now, happy Mother’s Day to all you Moms out there. What are your feelings about Mother’s Day? If you struggle with Mother’s Day and/or your relationship with your mother, how can I pray for you? I didn’t know Anne Lamott’s point, but I like it! It’s more complex than I thought! Hahaha! Fun to experience a change of mind with you, Christie! Thanks for stopping by and reading. I hate Mother’s Day because perfect strangers get in my face to wish me “a happy Mother’s Day.” I am single and my mother died over 50 years ago, and no, I don’t spend my life being guilty about it. (I don’t walk up to every man I see and wish him “happy Father’s Day.”) Few things are more tiresome than wasting time arguing with / explaining to alleged adults WHY, as a single woman, I do not have kids. Another reason I hate Mother’s Day is because it is being used to promote and encourage illegitimacy which hardly needs promoting, given that over 40% of the births in this country are to unmarried women. Among some groups, the percentage is well over half. Why should we honor every little teenage trashbag who hops in bed with her boyfriend of the moment and gets pregnant, thinking it’s great because now she can get WIC, Food Stamps and Section 8? I have read that the woman who invented this “holiday” came to dislike it herself because of the rampant commercialism that became associated with it. It’s a good thing she is long gone, because if she had seen today’s culture of 14 and 15-year-old girls WANTING to get pregnant because they think it’s cute, she would have dropped dead.